King, the development studio behind the addictive Candy Crush Saga game that has electronically enslaved every commuter on the train but you—unless they already got you, too—is now extending its mind-control efforts by enforcing its supposed ownership of the word “candy.” As Gamezebo’s Jim Squires reports, King has received preliminary approval of a trademark for use of the word “candy” in such applications as “computer game software,” “casino and gambling facilities,” “headwear,” “stockings,” “waistcoats,” “juke boxes,” “baby monitors,” and “spectacle cases,” among a great many others. While the baby-monitor industry probably doesn’t have much to worry about, there is cause for concern among makers of smartphone and Facebook games that ostensibly compete with Candy Crush. Gamezebo spoke with one iPhone game developer who has already been targeted by King’s legal team for using “candy” in his game: Benny Hsu, the creator of All Candy Casino Slots—Jewel Craze Connect: Big Blast Mania Land. Hsu says that because he can’t afford a lawyer, he may have to just remove the offending word from the title of his app, although in fairness, he’ll still have plenty of title left over after that. 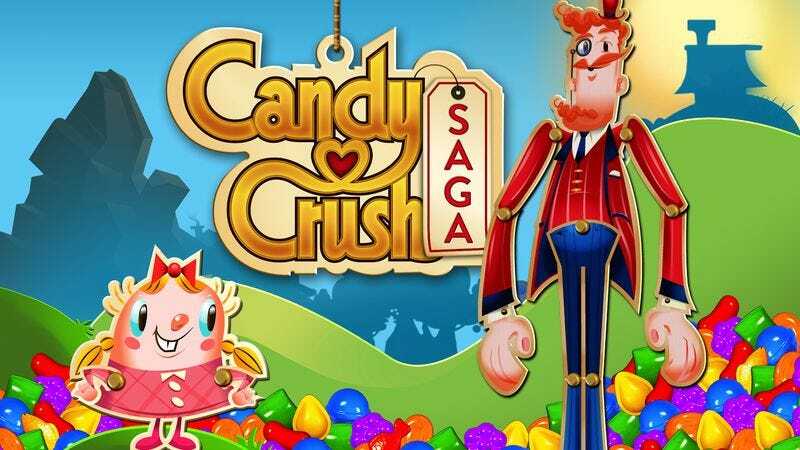 More to the point, the legal action is an aggressive move by King, which had previously been content to sit back and enjoy the mountains of revenue generated by Candy Crush’s sophisticated souls-to-dollars conversion technology. Not to worry, though. The populace is sure to rise up and resist this linguistic power grab, just as soon as they match a chocolate bomb with a striped lollipop to get the jelly beans out of licorice jail and advance to level 295.